Chart Sense for Writing is Available! I have not kept up my end of the bargain to blog more! I have been busy in classrooms and finishing my latest book. This book is so special to me that it has been all consuming. I want to thank all of the teachers across the nation who have let me come into their classrooms, train them, and learn from them! This book could not have been possible without the support of so many people. Often the people who inspire you the most get the least amount of thanks. As I prepare for the release of this book I want to thank the teachers, staff, and principals of Eastside Elementary, Annette Winn Elementary, and Chestnut Log Middle School in Georgia. Almost two years ago, you guys were my first group of teachers to embrace charts, show me even better charts than I ever dreamed of, grow writers, and truly were the initial inspiration for a book of this nature. I can’t run through all of the names, because I would run out of room! Each and every one of you were an inspiration!! Your dedication to writing instruction and your students in amazing. A special shout out to Tiffany McBean, Z. Satterwhite, Kelli Rowsey, Tisha Weaver, Andrea Battle, and Britt. You ladies are awesome, encouraging, and rocked out writing in a way that I could only dream of!!! Your early encouragement, laughter, and creativity contributed to this labor of love in more ways than you know! Thanks so VERY MUCH!!! For my fellow bloggers, teachers, and social media friends, you can get your own copy of these writing strategies on January 12, 2015. Can’t wait? 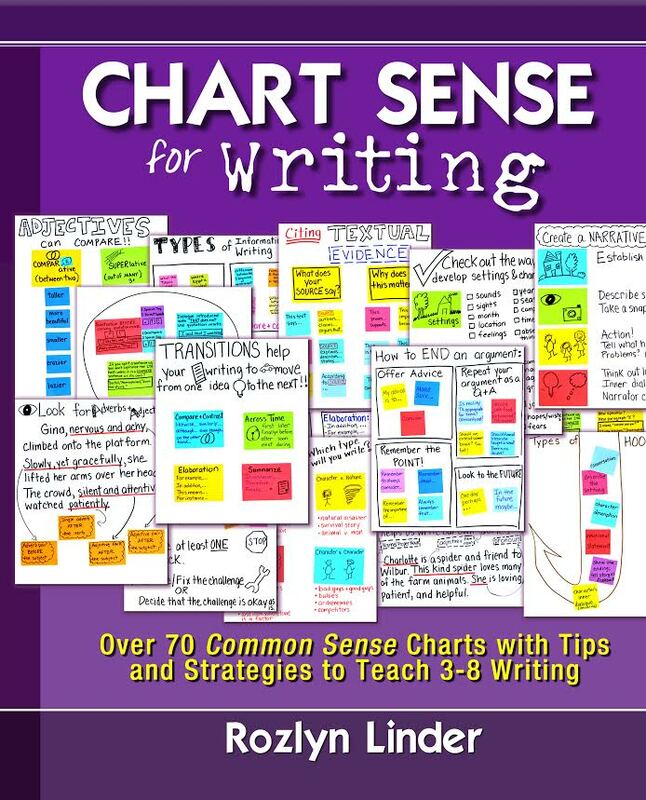 Preorder your own copy of Chart Sense for Writing on Amazon today. Use promo code BOOKDEAL25 (good all week long) at Amazon checkout to get an extra 25% off! Chart Sense for Writing is here! If it is anything like the Chart Sense for reading I will be so grateful!! Hi my name is Janette and I just wanted to drop you a quick note here. I discovered your Chart Sense for Writing is Available! | On the Web with Roz Linder page and was thrilled! I ordered the book on Amazon and AM IN LOVE! Please tell me if you plan to do any work in Chicago. I would love to bring my 5th grade team!